Believe. It really does exist. For years I have lived with a flood of daily spam messages and an email inbox that scrolled for pages and pages. I absolutely dreaded opening my email application. Every time I did, there were new spam messages to delete, a new fire to put out, and a list of rotting emails that I had put off answering for weeks, even months, because each required something more than a simple response, each almost a project in itself. Not for lack of will, I tried a number of things to improve the email experience. I set my mail application to only check email every 15 minutes. I turned off the email alert sound so arriving email would not distract me from the current task at hand. I would make heroic efforts to clear my inbox each day before shutting down the computer but the more difficult emails would survive and sit in my inbox along with half-written email drafts in the drafts folder until the next cleaning battle which was essentially a never ending saga. On the eve of every third new moon, I would sheepishly and with great guilt, looking over my shoulder to ensure that not even the office janitor was around, file the oldest unanswered emails away as if they had been taken care of properly. My email experience was clearly broken; my inbox weighed me down every time I looked at it and there seemed to be no way out. That’s correct, it’s empty. 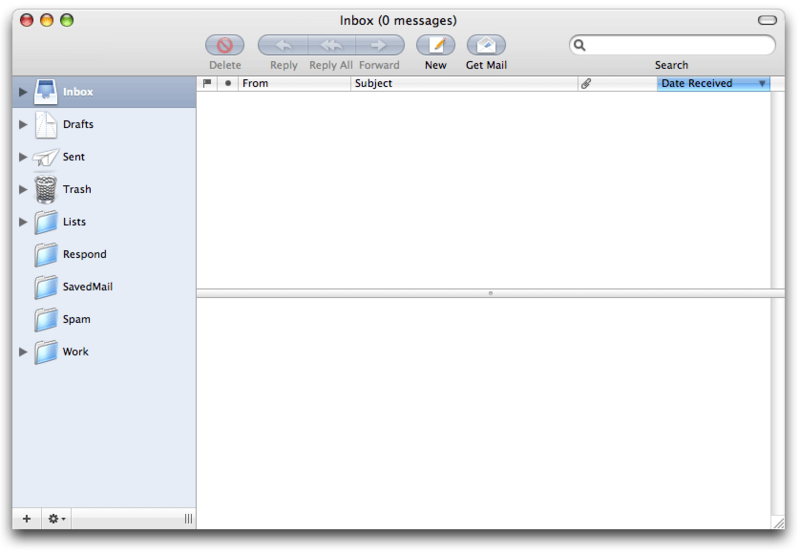 My email inbox is completely empty. Zero inbox, zero spam. Now, you maybe thinking, “Yeah sure, it looks like that for the screenshot. For a few hours maybe, but tomorrow there’ll be a growing list of emails again.” I assure you that my inbox has been completely empty for two weeks solid. You too can experience email Nirvana. (And you don’t need to be on a Mac and use SpamSieve. If you have corporate email with spam filtering, Gmail, Yahoo, Hotmail, etc. you probably have spam filtering that is good enough. If you host your own domains and use POP or IMAP mail, find a good third-party spam filter for your mail application.) Apply Merlin’s sustainable “Inbox Zero” approach and henceforth live in email bliss. It really does work. This entry was written by Brian McNitt, posted on at 7:18 pm, filed under Business, General Computing and tagged inbox, laughing squid, mcnitt, merlin mann, spam, spamsieve, trendmedia, zero. Bookmark the permalink. Follow any comments here with the RSS feed for this post. Post a comment or leave a trackback: Trackback URL. Pieter-Bas referred me to you. Since I am passionate about efficient knowledge working, your story was very interesting to me. Obviously we all want ‘zero inbox’ but the essence is not to over-organize (500 subfolders like I have) or delete spam (which should happen automatically). The solution is simple: Get less email. To get there is less simple and requires a lot of EQ and other human skills. Who subscribes to this idea? I agree. One thing Merlin suggests is to limit all work emails to five lines or less. If you keep your emails and responses brief and direct, it’s harder for others to not follow suit. Maybe something to try?